You have enough details to worry about without having to locate and contract with a freight carrier to ship your trade show displays. Not all freight carriers are created equal, and with the significant investment you’ve put into your trade show displays, unreliable shipping services are not an option. We do this for a living! We’ll pack, pick up, transport and deliver your exhibit to your trade show-and professional labor crews even install and dismantle your display (in all trade show-heavy states). When you work with E&E Exhibit Solutions, rest assured our E&E referred freight carriers will get your trade show exhibits where they need to be—on time and in perfect condition. E&E has extensive experience shipping trade show booths and supplies; we are adept at managing the delivery process from start to finish. Whether it’s shipping to the advanced warehouse or knowing which forms to fill out, we have the knowledge it takes to manage your shipment effectively. 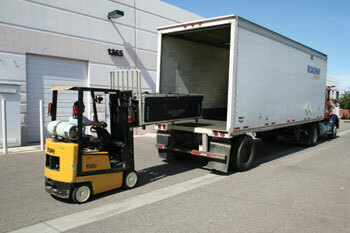 We can also help to control your exhibit shipping costs, while protecting your investment at the same time. Don’t trust your precious cargo to just anyone!